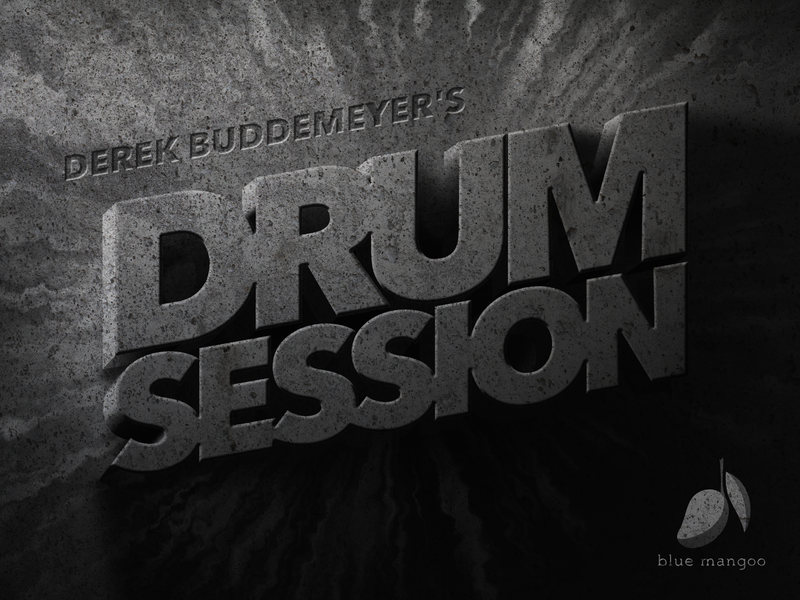 Derek Buddemeyer’s Drum Session is a simple, quick and great sounding way to create and edit acoustic drum tracks. Packed with 30 sets of acoustic drum samples, and 3600 editable patterns and loops in a very simple interface. The key word here is “acoustic”. This is not a drum machine with artificial or synthetic sounds. No 808 or the likes. This is all about real live drums from the real world. 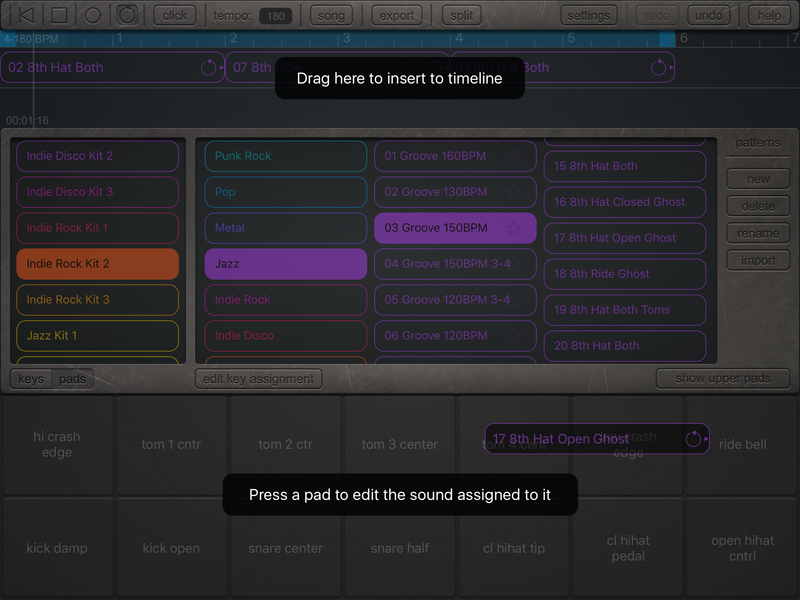 Drum Session uses a familiar touch, drag and drop workflow. First you select the Kit, next select the Genre, then select the Groove, and finally the pattern. Touch, hold and drag the pattern (seen in above screenshot) up to the timeline and let go. Bang! You’re getting a track started. Select other patterns and repeat, or hold the desired pattern in the timeline at its end and drag to copy further down the timeline. So easy it’s hard. I mean that it wasn’t intuitive to me right away. That’s my fault for expecting something more complicated. I’ll explain further after this next screen shot. I spent so much time (needlessly I might add) trying to find the pattern editor button. Where the hell is it? Why can’t I edit in a sequencer style with a piano roll that I’m used to? After several hours of insanity I realized finally how disconnected my brain was from the true beauty of Drum Sessions work flow. Instead of dragging the pattern upward to the timeline and cursing in vain for not being able to find the “button”, I was embarrassed to find that the same is accomplished by simply dragging downward to the keys or pads. When I let go, viola. Bingo. See now below. Holy crap I must’ve inhaled one too many tubes of modeling glue. There it is! The editor. Just how I like it. So with that settled I could finally start using this childproof app to its full potential. 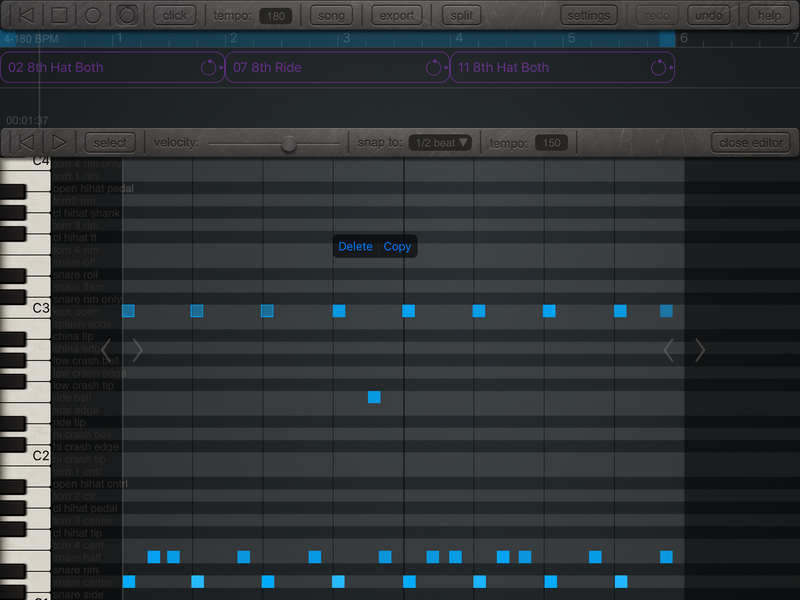 Editing patterns is pretty straightforward as you can see from the above screen shot. One thing I didn’t like was how dim the sample labels to the far left (brought up to temporary view by touching any of the keys on the further left keyboard) are. Lots of squinting and retouching the keys to bring them back into view for indentifying each samples position. Hey Derek? Could you maybe brighten or increase the contrast or something please? Whatever you decide as long as it’s easier to see would be awesome! Full support for Audiocopy, Audiobus, Inter-App Audio. Record, import export etc. Nothing is missing. So that’s where I’ll leave this review. 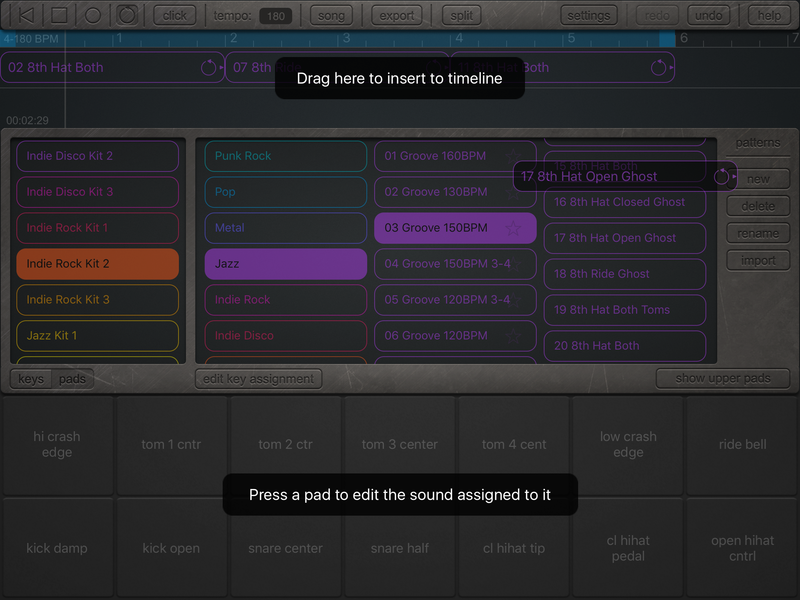 Drum Session is a very nice acoustic drum track maker with all the necessary editing parameters. No strange FX or anything, and honestly none are necessary anyway. The samples are high quality and the overall usability is as well. For a non-drummer type like me, this is a very welcome and thoughtfully developed app. I really like this. I think you will too. Any gripes I had have been corrected or corrected improved. Everything’s come together real nice. Much easier to see things and an already excellent app has become even better.